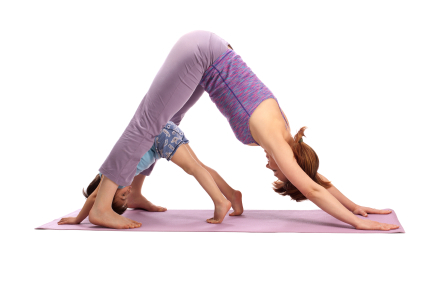 Why practice yoga with children? In each cell of our body lies the memory of when you felt light and unburdened. Letting go and sharing your yoga with a child allows you to reawaken, that feeling good in each simple moment. When you have a joy in your heart, you express it through movement. A two year old child will teach you properly if you observe them carefully. They can teach you that you should always move from your spine. Children don’t see failure as an option; they simply do it. And, if they don’t get it the first time, they do it again and again until they succeed. There are many people practicing yoga who insist on breathing like Darth Vader in yoga classes. They do ujjayi breathing so loudly that one may wonder if they get the point at all. The breath of a child on the other hand is relaxed and gentle and smooth and long. Because children feel into their bodies and listen, they never injure themselves by over stretching. For this reason, practicing Yoga with children reminds people to let go of unnecessary caution and fear of injury and instead feel into the pose.